Changing File Extension is really easy and quick in new Windows 8 Explorer. 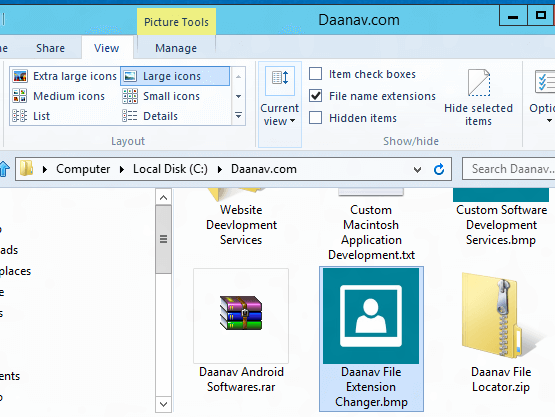 New Ribbon Interface of Windows 8 Explorer provides quick way to view or hide file extension. Have a look at the screenshot below which displays a Windows 8 Explorer window containing some files with their file extension displayed. By default Windows Explorer is setup not to display file extension, however it can be changed easily from the ribbon interface of Windows 8 Explorer. Keyboard Shortcut to Rename File remains as F2 as in older versions of Windows Explorer. In the above screenshot an image is selected and hence the Windows Explorer displays Picture Tool as the highlighted tab. This Way to change file extension works with all file types and is as easy as changing file name. Note the checkbox File name extension and note that it is checked in the Windows 8 Explorer Window. When File Extensions are being displayed by Windows Explorer, you can quickly change the file extension by renaming it. 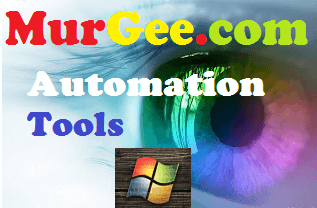 Once you have decided which file’s extension you wish to change, select it in the Windows Explorer, navigate to the View Tab, Check the CheckBox labelled File name extension and finally issue a File Rename Command. By default Windows 8 Explorer will select the file name only and you would need to manually change the file extension. Note that this file extension changing way does not changes file type. File Extension Changer can be sued to change File Extension of Multiple Files easily and quickly. Yes Explorer of Windows 8 also supports bulk file rename methods where you can select multiple files and rename them in one step.